How many of you are aware that mere sprinkling of sunflower seeds on smoothies, salads or curds can enhance the taste of the foods? Well, this should not be the main reason why you should be including sunflower seeds in your diet, i will let you know more of what it entails. Sunflower seeds are packed with vitamin E, phytosterol, calcium and some other nutrients, which have a lot of health benefits. Below are 6 health benefits of sunflower seeds. 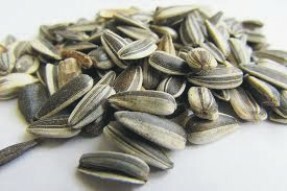 Because of their high content of vitamin E, consuming sunflower seeds can help you acquire a long hair. or a thick and lustrous black hair. Vitamin E does not only improve blood circulation to the skin and scalp, it also increases the supply of nutrients to the roots of your hair, thereby increasing hair growth. Sunflower seeds contain phytosterols, which lowers LDL (low density lipoproteins) cholesterol. Also, it contains essential fatty acids (EFAs) which plays a key role in the regulating of cholesterol. thereby lowering the risk of heart disease. When you consume a handful of sunflower seeds before going out, it helps you lower your cravings for alcohol by increasing the levels of dopamine. Dopamine is a brain chemical. Drinking excess alcohol lowers your dopamine level and hence, makes you crave for more alcohol. Enriched with antioxidant, vitamin E, and as a good source of magnesium, the sunflower seeds helps in regulating muscle contraction, and hence, helps a woman deal with mood swings and abdominal pain. Additionally, this seeds also help in maintaining the level of iron in your body. Consuming a hundred gram of sunflower seeds have the same amount of calcium as drinking a glass of cow's milk. Therefore, if you are the type that do not like milk or you are allergic to it, then you should consider increasing your intake of sunflower seeds. The presence of high level of selenium in sunflower seeds scavenges free radicals and also they protect cells from damage. Therefore, increasing your intake of sunflower seeds can not only boost your immunity, but it also lowers your risk of acquiring infections.